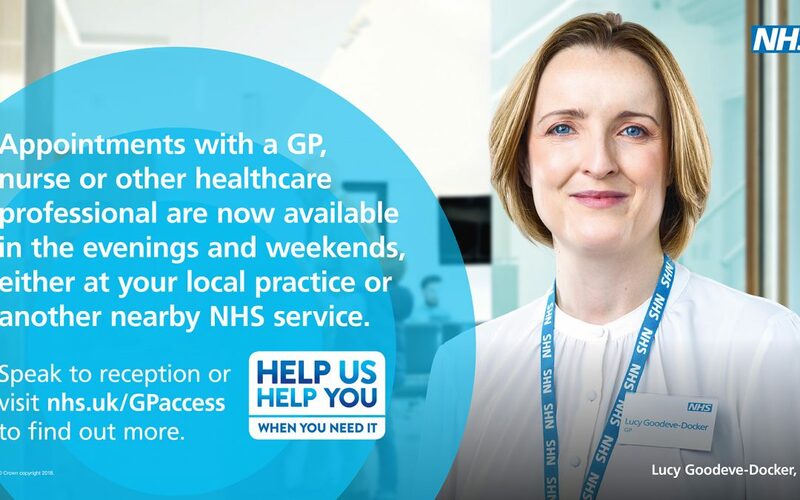 This December, NHS England and Public Health England are introducing a new campaign ‘Help Us, Help You’ GP Access to highlight that appointments with a GP, nurse or other healthcare professional are now available in the evenings and weekends, either at a local practice or another nearby NHS service. The campaign will highlight that evening and weekend appointments provide the public with more choice, greater convenience and increased access to healthcare appointments, when and where they need them. By utilising these appointments, the public can stay well, prevent illness getting worse, access the correct healthcare when they need it and get well again sooner. The ‘Help Us Help You’ campaign aims to make it easier for the public to understand the things they can do to manage their own health and get the best out of the NHS. This includes helping the public navigate the right NHS services for their medical need, such evening or weekend appointments with a local GP, nurse or other healthcare professional. For more information on GP Access service visit www.nhs.uk/GPaccess.